[R50R, Big White Ski Resort] takes full advantage of its location on the edge of the Okanagan Valley in British Columbia. The region is renown for its wines, and Big White’s Kettle Valley Steakhouse is one place to give them a try. The restaurant can pair together just the right wine for dining and brings in winemakers for special events. 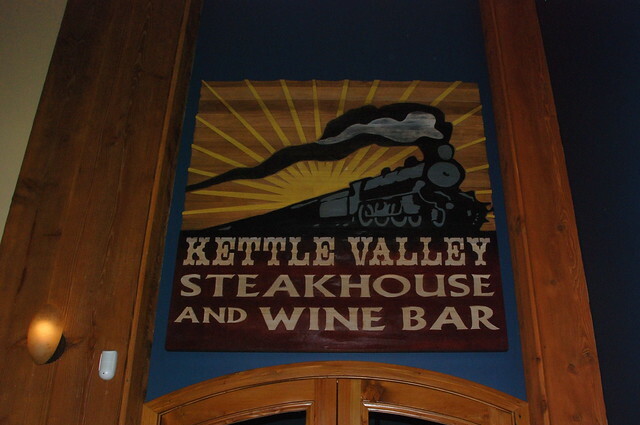 Located in the Happy Valley Lodge, the Kettle Valley Steakhouse welcomes families for dining. But it’s also the perfect place to ditch the kids for a quiet adult meal. You can send the kids outside at the lodge for hot chocolate around the bonfire, ice skating, ice climbing, or tubing. Big White's Kettle Valley Steakhouse is located in Happy Valley Lodge at the bottom of the gondola. Photo by Becky Lomax. Meanwhile, pair up your courses with Okanagan wines and start dining on appetizers or salads, many featuring locally sourced ingredients. Winter greens come topped with with roasted candy cane beets, brussell sprouts, gala apples, and a Roquefort cheese with peppered bacon vinaigrette. You can order up your hand-cut Canadian beef in a myriad of steak sizes and sauced with the demi-glace of your choice. The cowboy cut steaks can be ordered by the inch, and the filet mignon satisfies a petite to hefty eater with the six-, eight-, or ten-ounce cuts. Accompaniments change daily, including fresh-baked bread that could be a sun-dried olive rye. For a scrumptious dessert, the Crepe Suzette offers a taste treat as well as a show. 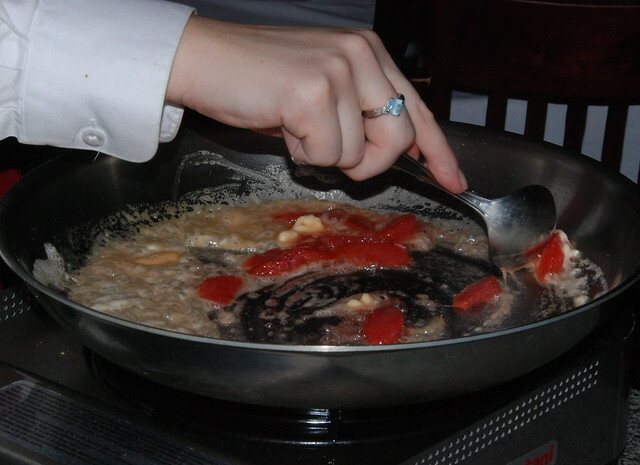 It is flambéd tableside, with blood oranges, hazelnuts, Grand Marnier, and Frangelico. Blood oranges, hazelnuts, Grand Marnier, and Frangelico are prepared tableside for Crepe Suzette at the Kettle Valley Steakhouse at Big White. Photo by Becky Lomax. The last weekend in March has two special wine events. The Kettle Valley Steakhouse presents one of its Evening With A Winemaker series on March 30. The event features Stephanie Leinemann of Peller Estates with a reception at 6:30 p.m and dinner at 7 p.m. Tickets cost $70 per person with tax and gratuity additional. The next night, March 31, showcases white wines from the Okanagan in Big Whites At Big White. The event, which runs 6-9 p.m, includes appetizers from the Kettle Valley Steakhouse as well as other Big White restaurants such as Carver's Restaurant, The BullWheel, Globe Café and Tapas Bar, and Santé Bar and Grill. Tickets cost $30. Reservations at the Kettle Valley Steakhouse are recommended for dinner and required for the winemaker series. Call 250-491-0130. Tickets for Big Whites At Big White are available by calling 250-491-6111.